With the 2009 Mobile World Congress in Barcelona now in full swing, several bits of Pre-related news continue to trickle out in the biggest showcase for Palm's new product since last month's WebOS and Pre announcements at CES. Despite not being demonstrated or officially announced yet by Palm, the first "live" GSM Pre has been spotted in the wild. 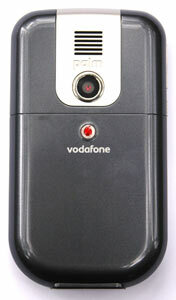 As reported by Pre Community, a Pre has been photographed with a Vodafone SIM card inserted. So with the eventual appearance of a GSM Pre all but assured by this MWC sighting, the usual questions of pricing, availability and carrier partnerships remain unanswered. The current rumor du jour, however, has the Pre being a Vodafone exclusive at launch and presumably until at least 2010, much like the Sprint tie-up for the CDMA Pre here in the States. The presence of a SIM card slot is also certain to please conspiracy theorists who remain unsold on the Pre's technical merits. In fact, some will argue the that SIM card slot's presence on a GSM Pre designed simultaneously with its CDMA sibling erves as a total debunking of various Palm staffers' claim that a microSD card slot could not be added to the Pre due to design, formfactor, and engineering constraints. This sentiment was also echoed in detail by Palm's own Matt Crowley's in a Facebook Q&A session a few weeks ago. >In fact, some will argue the that SIM card slot's presence on a GSM Pre designed simultaneously with its CDMA sibling serves as a total debunking of various Palm staffers' claim that a microSD card slot could not be added to the Pre due to design, formfactor, and engineering constraints. "That's what I'd like to know about it." is to be believed, the Pre is in PRE-beta form both software AND hardware, thus a microSD Pre-wide is not out of the question. "Couldn't be done" is about the stupidest excuse ever. It all boils down to "making it all fit", and if you have room for a SIM slot, then MicroSD is easilry done as well. Just a deadpan excuse. Just make sure it has no branding! RE: Just make sure it has no branding! The carrier info is in the LCD ala iPhone. Thankfully this gives good reason for the carriers not to turn a work of art into another shameless billboard, not unlike this one. Although, both hands don't have enough fingers to count the people I've asked over the years "what kind of phone is that", and they reply with "a Verizon" or "a Sprint" etc. The carriers get quite a bit of pub from those labels with the general populous. I wonder why people keep saying that it's a GSM phone, when in fact GSM is solely a 2G-term (or at least so I've been told) and from what I've gathered this is in fact a 3G-version (I think the European 3G-standard is UMTS). Easiest way to ID the two opposing North American camps. My Q is if Vodafone releases at same time as Sprint, then can we buy one from them and use it on AT&T in the states etc? Are the new UMTS phones backwards compatible with existing GSM networks and SIM cards? GSM yes, SIM-cards no. Due to some security problems with the old GSM SIM-cards they had to completely change them so if you change to a UMTS-phone you need to get a new SIM-card. LiveFaith - guess we'll have to wait and see which freqs the Euro Pres support. AT&T is 850/1900 Mhz. hotpaw4: yup. Most fall back to GSM when there's no UMTS coverage. You might need a new SIM card to go from GSM to UMTS if your current one is really old, but you keep the number. RE: GSM? Probably not...Actually, yes! I think they are still all "GSM". They're just not running on the GSM standard. GSM is both a governing body and a technology. Originally, they had the same name. GSM the governing body is now promoting HSPA and LTE, but phones that work on their adopted technology flavor are still "GSM" phones since they comply with the GSM (even though HSPA is technically a CDMA standard). And they *do* still all work on old GSM (the protocol) networks. GSM was the name of the group that originally developed the GSM standard, but the current technical organization that oversees the GSM and WCDMA/UMTS standards is called 3GPP. There was an ill-fated marketing attempt to use the name 3GSM to refer to WCDMA/UMTS, but it didn't really work. 3GPP also developed the LTE standard to which many WCDMA and CDMA2000 operators plan to migrate. Both CDMA2000 (commonly referred to as CDMA) and WCDMA/UMTS are based on CDMA technology. HSPA is an evolution of the WCDMA/UMTS technology, much like CDMA2000 1xEV-DO is an evolution of the CDMA2000 1X technology. WCDMA/UMTS/HSPA and CDMA2000/EV-DO are sort of like two branches of the same tree, but they're certainly different from each other, and both very different from GSM. I think all (but certainly most) WCDMA/UMTS phones also contain GSM chips, allowing them to fall back to GSM networks when WCDMA/UMTS networks are unavailable. Bringing this back to the topic, I would guess that that Pre floating around at MWC is a dual-mode WCDMA/GSM model, or at least that the final version would be. Not much point in making a GSM-only Pre given the slow data speeds, and WCDMA-only would cause problems when users inevitably went to an area with poor (or zero) WCDMA coverage. Thank you for that information, it was very helpful. For those who didn't want to look(due to the technical information provided), AT&T uses WCDMA/UMTS for their 3G network, with the GSM fallback. This means that we WILL be able to use an unlocked "GSM" version here in the USA once it becomes available. I wonder how long it will take hackers to unlock the Vodafone version once it becomes available? On that pre community site is says "Palm aren't announcing the GSM version of the Pre at Mobile World Congress". ...why isn't it based off of Android? What good would that do Palm? They already are trying to compete as a minnow in the sea (S/E, HTC, Moto, Samsung) with WM. Doing Android would similarly leave them without enough significant proprietary ways of separating itself from those who would steamroll them. They are taking the Apple (& original Palm Computing) model of controlling SW & HW to create better differentiation. All JMHO, but I think this is the correct way for them to move forward with any real hope of long term survival / success. Companies such as Vodafone have outright stated that they are trying to reduce the number of OSes they carry. True. But, it's one or the other SV. Either try to survive with the giants or carve out a niche' that they can't live without. The latter is Palm's only hope afaics. Since Palm for SURE is pumping WebOS, not Linux, the deeply underlying OS has meaning only for those who aren't interested in Version 1.0 of that deeply underlying OS. WebOS is Linux-based, but it's a modified, locked-down Linux (like you'd find on a Tivo or an Archos media player). There's a big difference. With a "pure" Linux device (i.e., something running a standard distro like Ubuntu or Red Hat) anyone who knows how can pick it up and hack the hell out of it. You can't do that with a Linux-based device, because one of the modifications they make to the kernel is to lock it down. For example, you have to jump through some serious hoops to even run a command on an Archos player, and forget (for all practical purposes) about actually compiling anything on it. Is Android actually a better OS than WebOS(other than the name)? If Palm really does have a hit with WebOS in terms of how you use the phone, that will really drive people to buy a Palm device. From the reactions to the Pre, I would say that Palm is going to do better with WebOS than with Android. Who knows, WebOS may do so well that even the business-class phones may end up being WebOS based in another few years. It is better to be different with a really unique and great operating system than to use an operating system that other devices may also use. We may see other devices use WebOS at some point, but for now, it is a factor that is making people really want to get a Palm Pre. One of the three biggest cellular providers in Israel announced it will be the exclusive Provider of Palm Pre HSPA devices.